If your dog eats Taste of the Wild, please read this, because your dog's life may be in danger. Last edited by Barry; 03-17-2019 at 10:01 AM. I can’t bring up this link,but I’m very interested in this info because one of my clients feeds her service companion dog this brand,also wondering if this extends to their cat food as well. Thank you for the heads up. Lead and other heavy metal content may depend on type of meat in food and/or where food was processed?? Please DO NOT feed any dog or cat Taste of the Wild pet food. There is currently a huge class action lawsuit pending with over 1100 complaints online claiming that many animals, specifically dogs have become either very ill or have died from the amount of toxins that are present in this pet food. Just put in your search bar or google, "Taste of the Wild class action suit." Read the declaration with the specific allegations and findings listed. There have also been instances with cats. Please be prepared to brace yourself when reading the high levels of toxins that have been found in this pet food. It is very upsetting to read. I have called the corporate office in Oakland of Pet Club who was not aware of this serious issue. Pet Club's upper level management did not seem to have much concern. Actually the person I spoke with was quite rude. In researching Pet Club's history online, it is not too impressive and actually questionable. Some red flags have come up about their past business dealings and their operation. Check them out for yourself online or otherwise, then decide first hand. I will not support any pet food supplier who refuses to acknowledge the serious nature of this horrific situation. I have also called Western Farms in Santa Rosa. I had suggested to both of these pet food supply companies to read the information posted online. Neither company chose to take the time or showed much interest in pursuing an online check as I had diplomatically suggested. 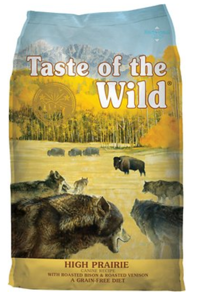 Both pet food suppliers refused to remove Taste of the Wild pet food off of their shelves. Western Farms says they will not do anything until there is a final recall. My rebuttal to that comment was to take these products off of their shelves until they are proven to be safe. How many more animals need to get sick or die before certain pet food suppliers act? Please research Taste Of The Wild Pet Food for yourself. It is all posted online. It is very simple to find. Again. DO NOT FEED ANY ANIMAL TASTE OF THE WILD at this time until and when this product can be proven to be safe for consumption. Your pet can become very ill or die from the recent findings that I have read online. Thank you for reading my long explanation.Thank you in advance for reposting this warning after you have done your own research first hand, then decide for yourself on what action you are comfortable pursuing. Thank you for this report. Hopefully some readers will take action, and not wait until their pet gets sick. I've found that many pet guardians don't want to believe that there are health issues with many brands, which have been sickening and killing dogs. (and cats) Hills is another example, with toxic levels of Vit D that's been killing dogs recently. They were kind enough to offer $5 for each dead dog! I'm hoping that more people get the message that profit is the bottom line, especially with most pet food manufacturers. Do we need more proof than the discovery of Phenobarbitol in pet food? This is the result of euthanized animals in the mix. The AAFCO (Association of American FEED Control Officials) Does everyone realize that "feed" is what's given to animals raised for slaughter? It's a lot different from healthy food for your pets. The best place to get the truth is at www.truthaboutpetfood.com from Susan Thixton, who dedicates her life, voluntarily, to give you the researched facts. Her life has been in danger, because she's considered a "whistleblower"
Last edited by Barry; 03-20-2019 at 02:00 PM. Low blood lead levels linked to lower IQ in Italian kids.